Fontina Val D'Aosta Cheese for sale. Buy online at Zingerman's Mail Order. Gourmet Gifts. Food Gifts. The truffle of the cheese world. The best Italian fontina is an exceptional eating experience – exotic, earthy, magical. I think of it as the truffle of the cheese world. Sadly, most fontina available in this country is but a pale imitation. But this is the real thing. 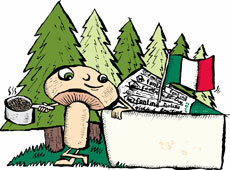 This supple cheese's flavor hints of pristine forest floors, then shifts to a lovely, lingering scent of wild mushrooms. I use it with Arborio or Carnaroli Rice to make a great Italian risotto. Like the truffles I compare it to, Fontina Val d'Aosta is very aromatic. That's a nice way of saying sometimes it can be stinky. The intensity of the aroma changes from wheel to wheel but with good Fontina like this, it's almost always present. Some people love it. Some are put off. On the novice to expert cheese lover spectrum, this is definitely more on the expert side. Something worth noting, depending on who's going to be receiving it. The wheels we're opening now are excellent. They are fairly mild but very pleasant, delivering the classic fontina flavors of rich forest herbaceousness, brothy savoriness, and funky mushroom.